I didnt get to workout this morning because We were running late this morning - I needed to take John to work so I could have the car to take Violette to the vet and run to the store. By the time we got back and finished up chores it was nearly lunch time so I figure working in the garden for a while would be something. Lunch - Oh this tasted so good! 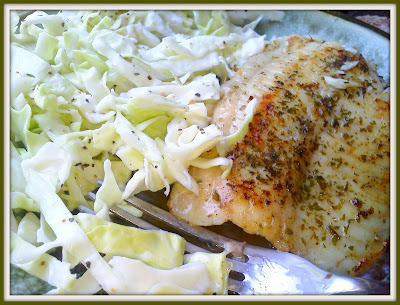 - Fresh fish- fresh parsley and garlic - fresh cabbage and homemade dressing for the slaw!! Dinner was a recap of lunch - It was SO good I couldnt help it !! After dinner I did walk 1/2 mile out in the hay field to help John clean out the hay loader.